LaTex Online Editor (XO) is a browser-based rich-text Editor (WYSIWYM) that creates perfectly formatted PDF documents. 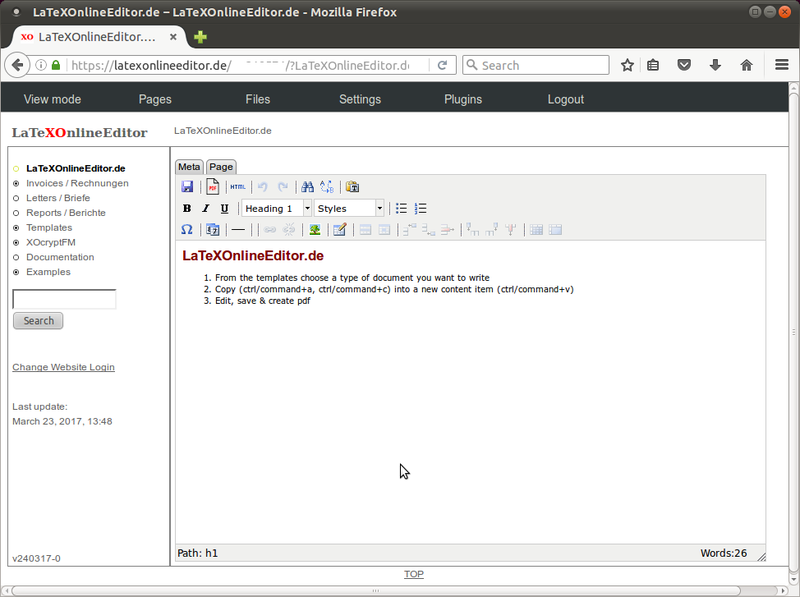 LaTeX Online Editor uses a content management system (CMSimple) in the foreground and the LaTeX technology in the background. You can create any type of document with the LaTeX Online Editor: an academic thesis, essay, term paper, letter, invoice, contract, or even a book. LaTeX Online Editor is the end of all your formatting woes. You can fully focus on the important part: your writing. Document layouts of the LaTeX Online Editor are completely customizable to, for example, the standard layout of your university or the corporate design of your firm. For LaTeX experts: You can still input LaTeX commands/code into the LaTeX Online Editor without limitations, e.g. for math formulas. info#LaTeXOnlineEditor.net (replace # with @). The LaTeX Online Editor is embedded into the CMSimple content management system and uses TinyMCE as the rich text editor. The PDFs are generated by the LaTeX formatting engine. The LaTeX Online Editor uses templates as the general source of formatting to allow the user to fully concentrate on writing. No more time wasted on adjusting margins or line spacing: it is the end of formatting frustrations and pains. The templates can be customized individually with your personal style, signature, or firm logo. The CMSimple content management system provides a straightforward organizational structure for your documents. How difficult is the LaTeX Online Editor to use? Not at all, I believe. The entire purpose of the LaTeX Online Editor is to make producing formatted documents as easy and efficient as possible. A basic understanding of text processors such as LibreOffice or MS Word helps. You simply write your text and generate your PDF by clicking a button. The Use of the content management system (CMSimple) is fairly simple and straightforward. You do not need any LaTeX, markup, or program language knowledge. How can I adjust the formatting? The idea is to leave the entire global formatting to the LaTeX Online Editor. Through the rich-text editor you can do simple formatting such as bold, italic, and underline. How can I adjust the global formatting, the templates of the LaTeX Online Editor? LaTeX Online Editor comes with a set of ready-to-use-templates for letters, articles and reports. Anyone with a basic knowledge of LaTeX can adjust the templates or I can help you. Can I still use pure LaTeX commands in the LaTeX Online Editor? Yes, you can. E.g. for mathematical formulas this makes sense. What about privacy & security in the LaTeX Online Editor? The LaTeX Online Editor system pays special attation to privacy and security. Every user has her/his own personal serverside instance/installation. All your texts/documents are stored encrypted on the server, although you do not have to keep them there. You can upload your PDFs and any other files into the LaTeX Online Editor's encrypted file system (XOcrptFM) and keep them there for future access. The decryption happens in the process of working with the LaTeX Online Editor in the memory - not on the hard drive. Therefore, even the server administrator cannot see your content. The web access is password protected. The network traffic through the Internet is encrypted (SSL/https). Can I use the LaTeX Online Editor with my co-workers or as a team? YES! You can create personalized accounts. The CMS makes it even possible to work simultaneously. What if I want my writings to be public? No problem! It is also possible to use the LaTeX Online Editor as a website/content management system, open to the public. You still can use the PDF creation function when logged into the backend. Can the LaTeX Online Editor engine be integrated in another CMS? Yes, any CMS using the TinyMCE rich-text editor. Is it possible to use the LaTeX Online Editor non-interactively? Where can I get support or have my questions answered about the LaTeX Online Editor? The LaTeX Online Editor comes with easy to understand documentation and FAQs. You may also ask me or the community.